Whether you’re new to voice picking or already a convert – this blog is for you. Voice Picking and the tremendous results it creates for your DC performance are just the beginning. If you apply Voice capabilities to other workflows, the benefits you’ll realize – in operational accuracy and efficiency improvements – will cascade. Voice technology is proven to optimize workflows and employee performance across a whole range of distribution center functions. From Receiving and Put Away to Packing and Loading shipments for delivery (and all touchpoints in between), voice-enabled workflows remove time and errors from warehouse activities. Why Is This So Critical and Relevant Right Now? Today’s modern distribution center is a hectic place, especially if it fulfills online orders from customers. As e-Commerce order rates continue to rise, busy distribution centers become even busier! The importance of fulfilling all orders accurately, on time, becomes paramount. This accelerated pace and pressure show no signs of diminishing. Timeliness and precision are undeniably critical for any order, whether items are destined for brick and mortar stores or shipped directly to end users who have ordered online. In both cases, the customer is counting on zero missteps as their intended items flow through the distribution center processes. Let’s think of distribution center operations in terms of a river. Typically, rivers start as streams high up in mountains. As they flow downward, these smaller bodies of water are fed by other streams, and even joined by other rivers. Ultimately, momentum carries the swelling waters into oceans and lakes – their final destination. The flow of discrete operations in the distribution center, from inbound to outbound, are like this natural cascade. Voice picking in the warehouse is one of the waterfalls along the way. In fact, all the interrelated functions in your DC operation move a cascading flow of material on a course to the customer. The momentum and power of the flow, from the top to the bottom, increases at every level, inbound to outbound. When you can achieve seamless operations and accurate progress at every point in the process, you are maximizing results for your company and your customer. This is especially true when online orders are being fulfilled, because you are breaking down large quantities of product received in bulk into a profusion of very small customer orders being shipped every day. Picture whitewater rapids rushing at a roaring speed to the shipping dock as the end of day approaches. Aren’t there similarities? Like rocks hidden in the rapids, errors can seriously disrupt an order’s passage toward successful fulfillment. Beginning with Receiving, problems occurring in any of the sequential steps in your DC can prevent the order from shipping on time. Disappointed customers, bruised relationships, lost profits and tarnished reputations are just some of the painful consequences of mistakes in the fulfillment process. No doubt about it, process snags are regrettable. But also preventable – in a stunning percentage of cases. Voxware customers see that Voice can be applied, with profound success, to all inbound and outbound workflows throughout the distribution center. Like a life jacket that keeps you afloat in even turbulent situations, Voice helps ensure that accuracy and efficiency flow through every sequence of your operation. 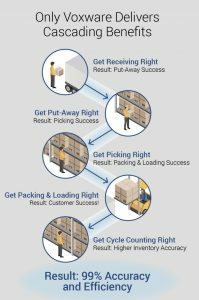 When you get Picking right, it reduces errors and worker interruptions and sets up success for Packing / Loading. If you get Packing and Loading right, your customer gets the right stuff the first time, on time, and you win customer loyalty and brand reputation. When you get Cycle Counting right, you maintain a high level of inventory accuracy that drives down pick errors and increases efficiency. As the positive results of Voice throughout the DC fall into place they create a total productivity benefit greater than the sum of its parts. Put another way, the flow out of the distribution center becomes a powerful force for creating brand success with the customer while contributing more positively to the operating cost of the distribution center. Voice drives successful processes by validating key steps, such as confirming a product is put away in the correct location to ensure picking accuracy. But Voice is not the only technology helping to bring improvements to the distribution center. By supporting multimodal technologies across all workflows, Voxware allows its clients to match specific modalities to specific tasks and individuals. For example, you may prefer Voice for receiving returns, but you may also want to use scanning technology. In addition, Augmented Reality can bring vision and digital image/video capture to the DC . As an example, in a Packing workflow, AR technology can easily document the contents of a shipment. The flexibility of a multimodal solution allows you to use the best tools for the task and individual. Lots to think about. Contact us to talk about the right solution for your distribution operations. Our goal is to help our customers flawlessly execute on commitments to their customers. Until next time.